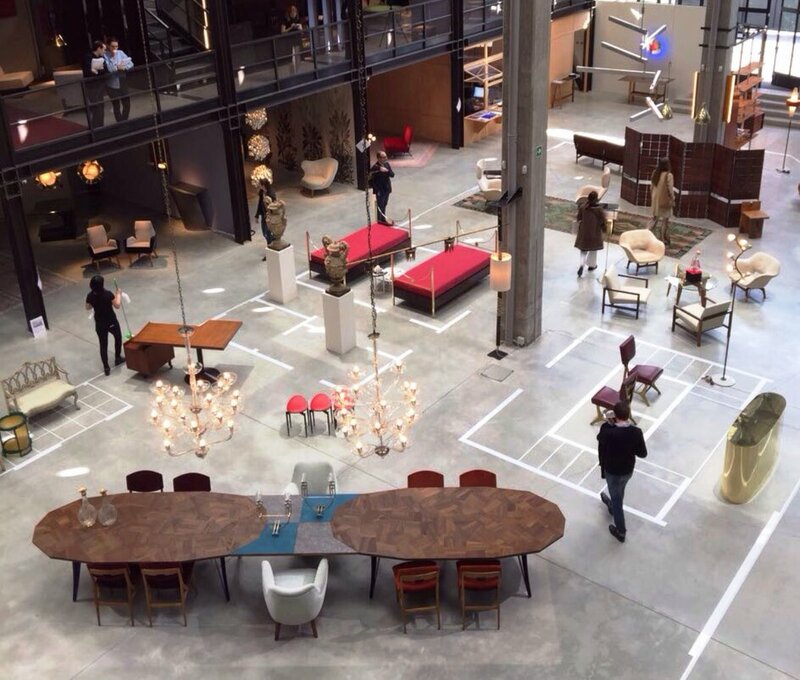 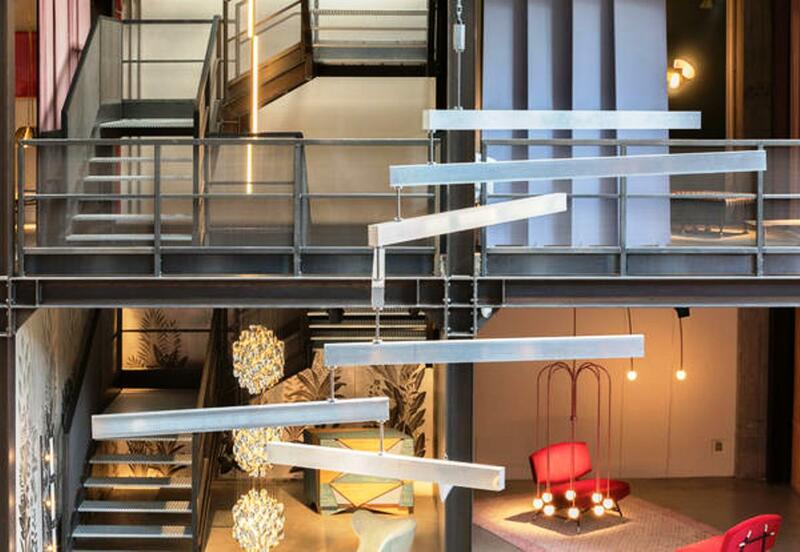 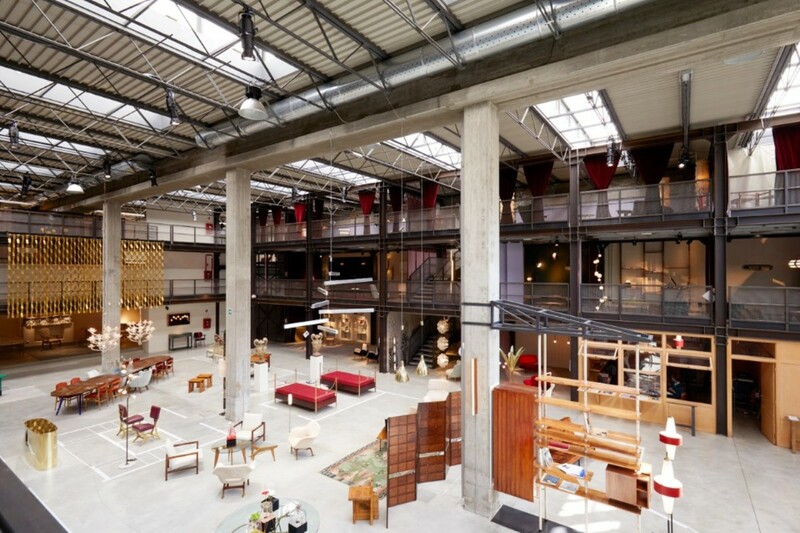 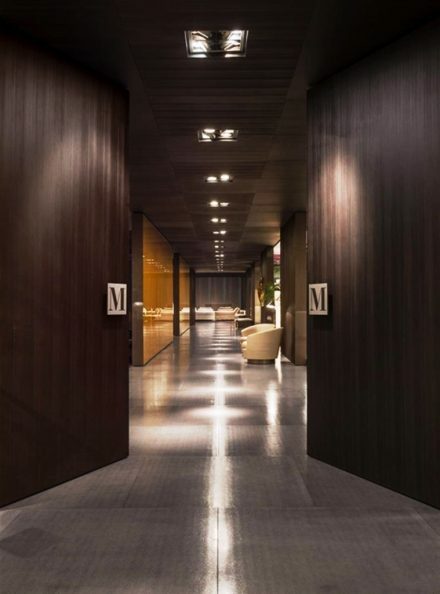 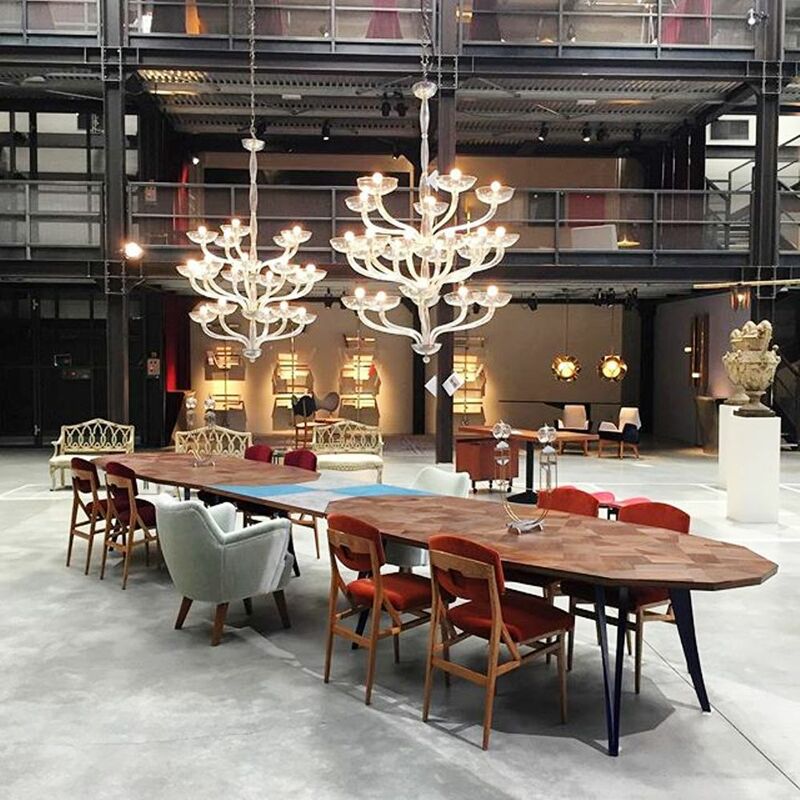 Entering the huge, ex-industrial warehouse where Massimiliano Locatelli has designed an architecture inspired by La Scala opera house in Milan, a space full of colors and movement, is like making a one-way trip into the history of design and priceless handicraft, a journey from which you will never want to return. 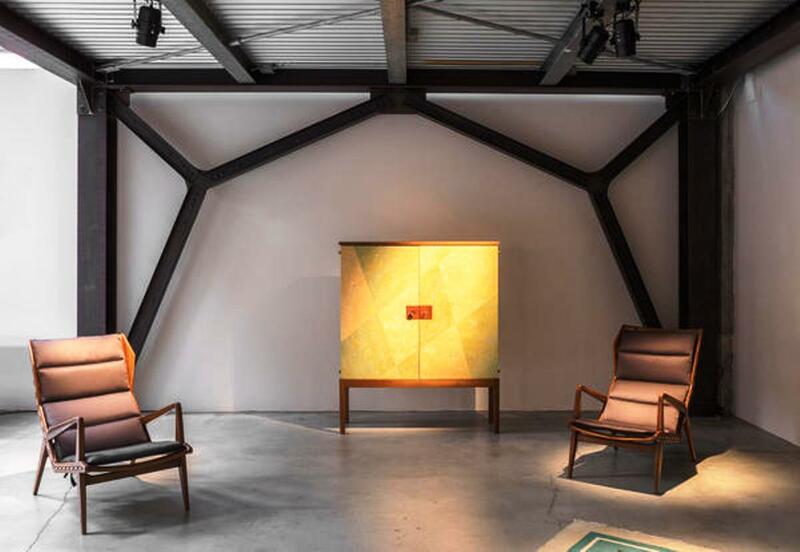 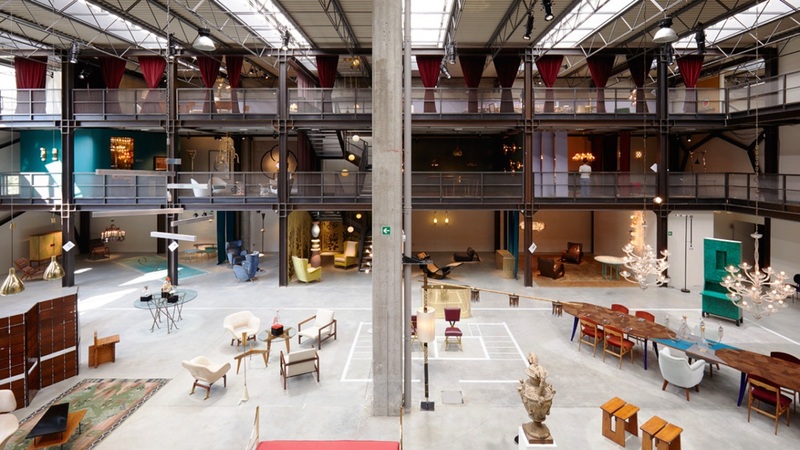 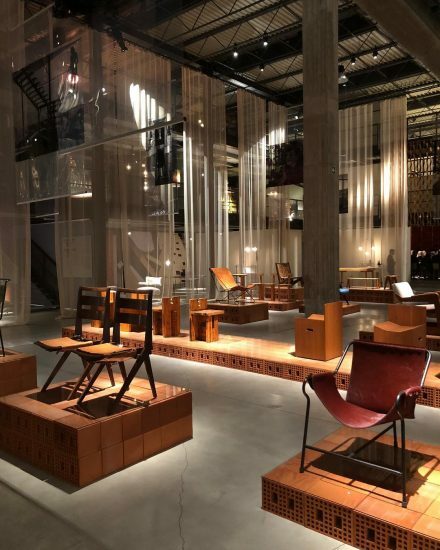 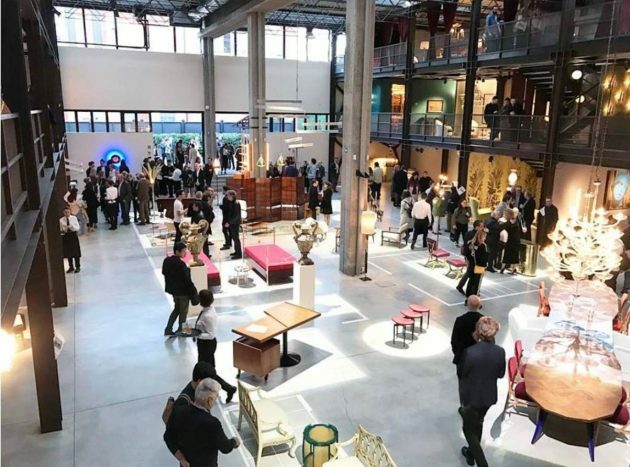 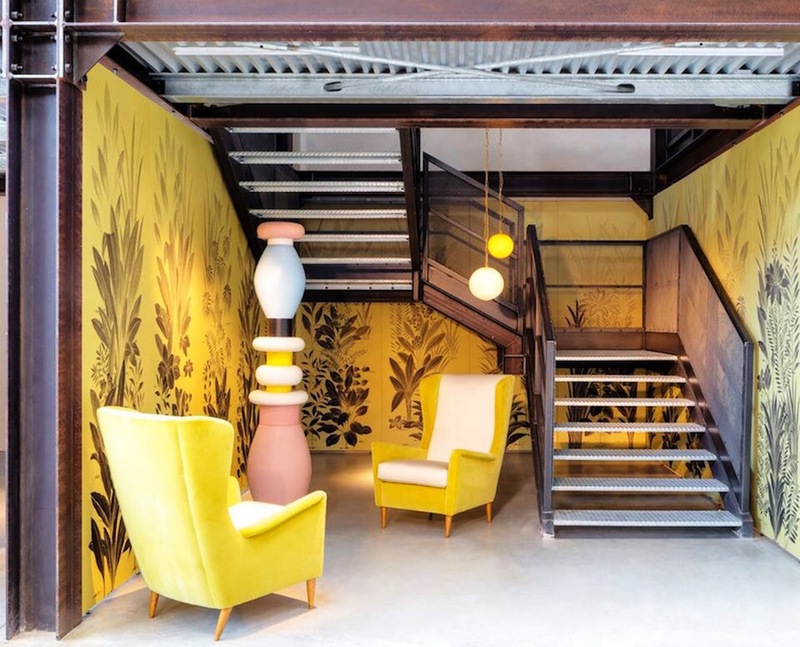 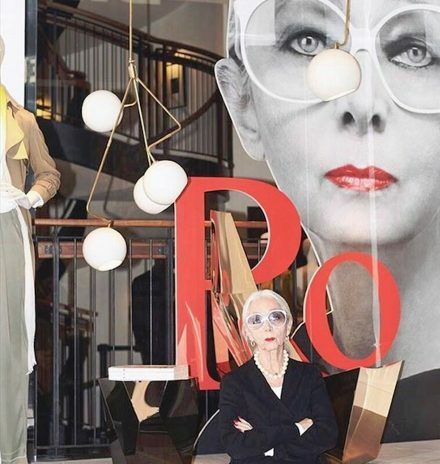 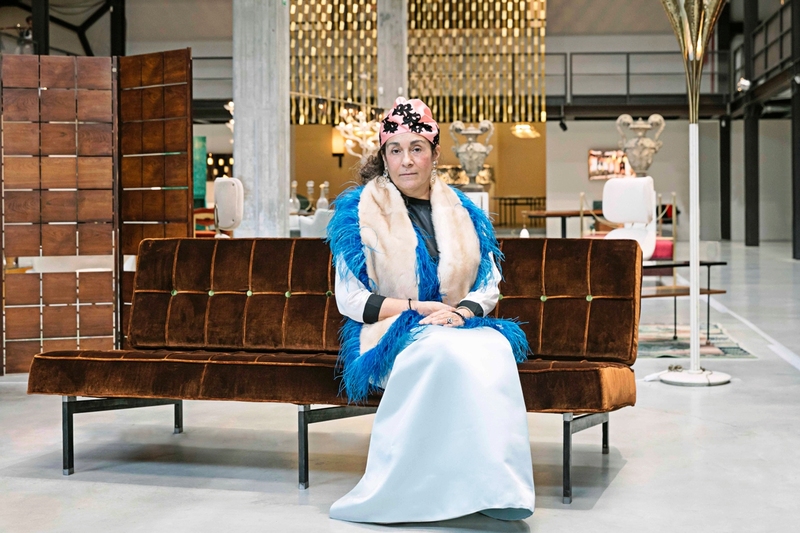 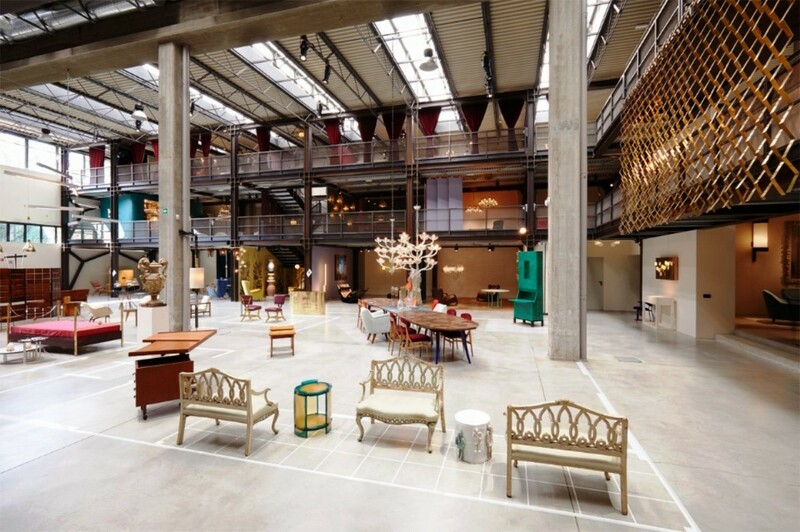 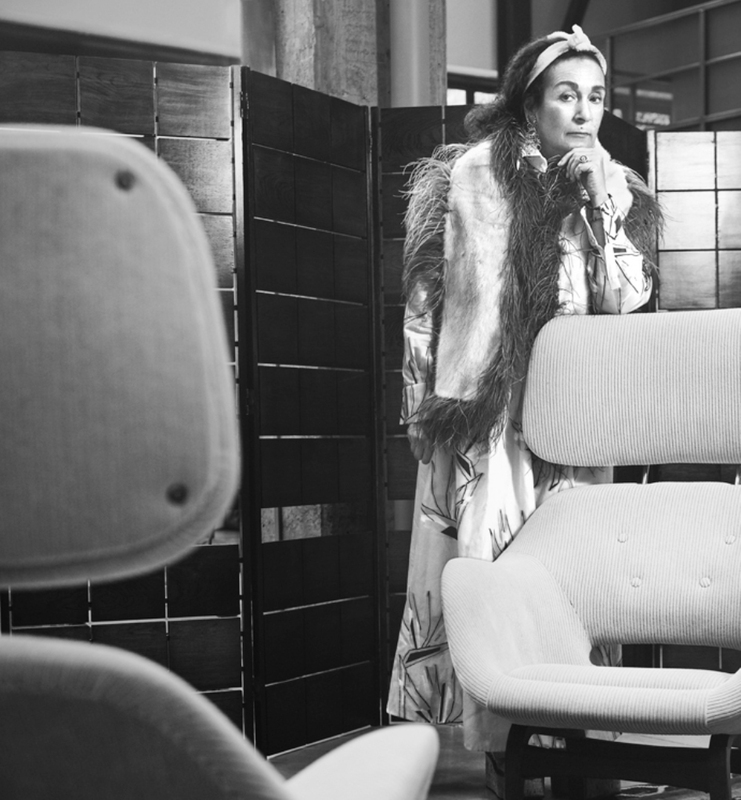 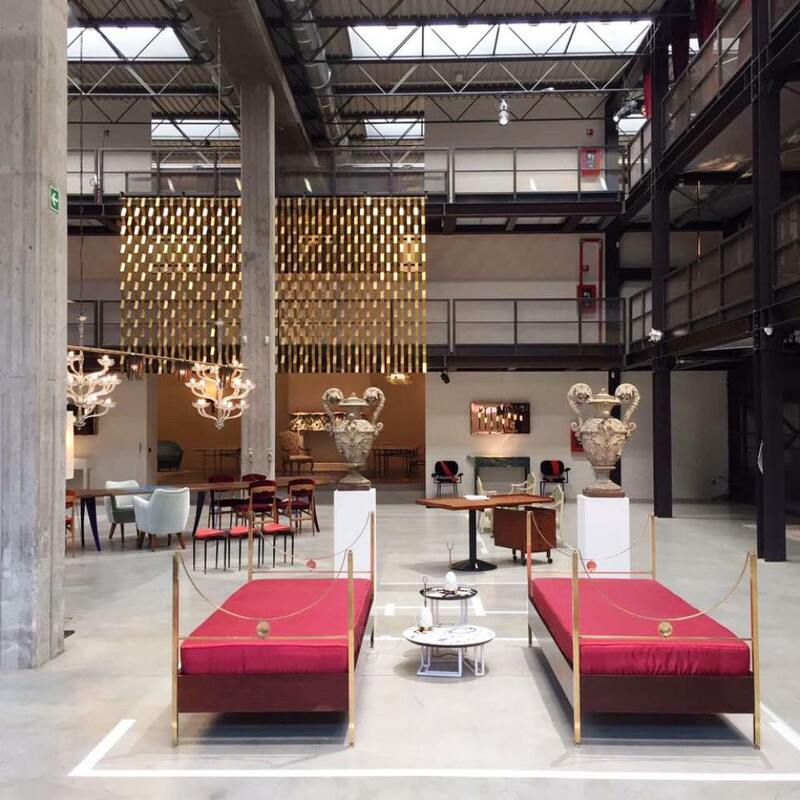 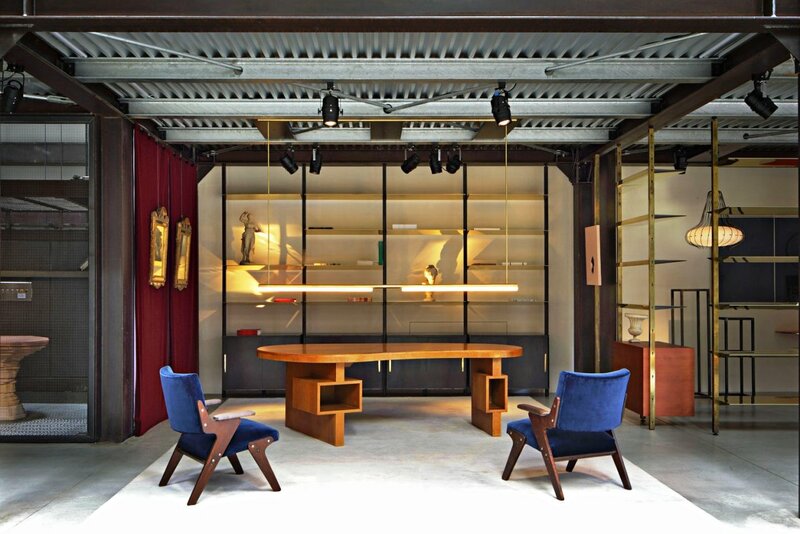 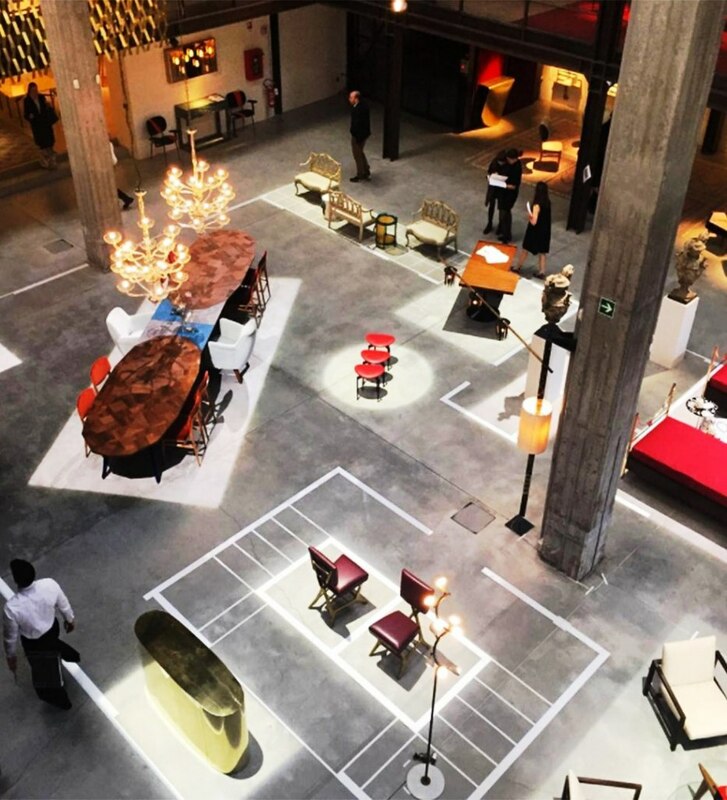 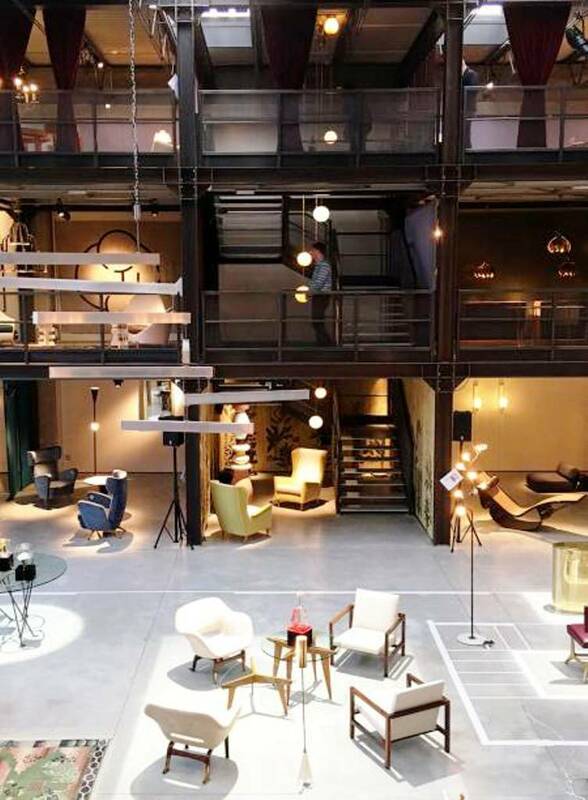 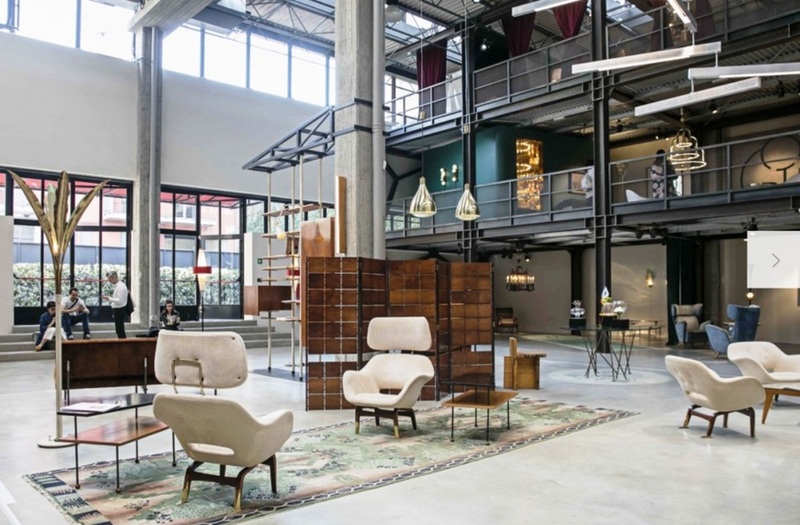 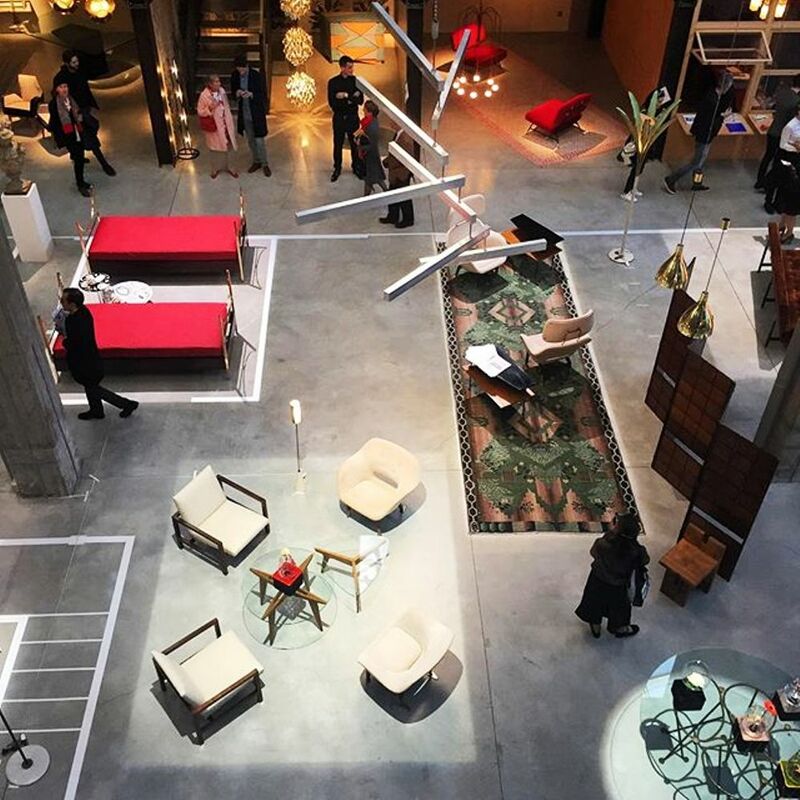 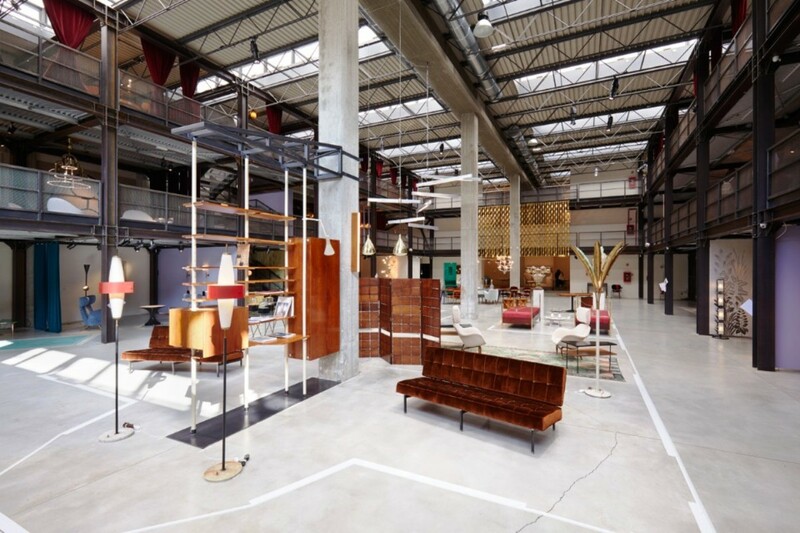 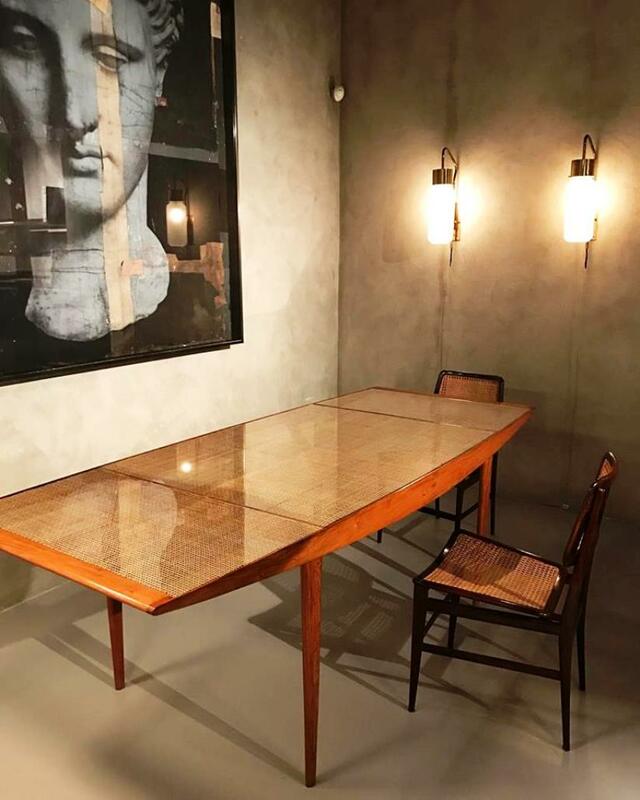 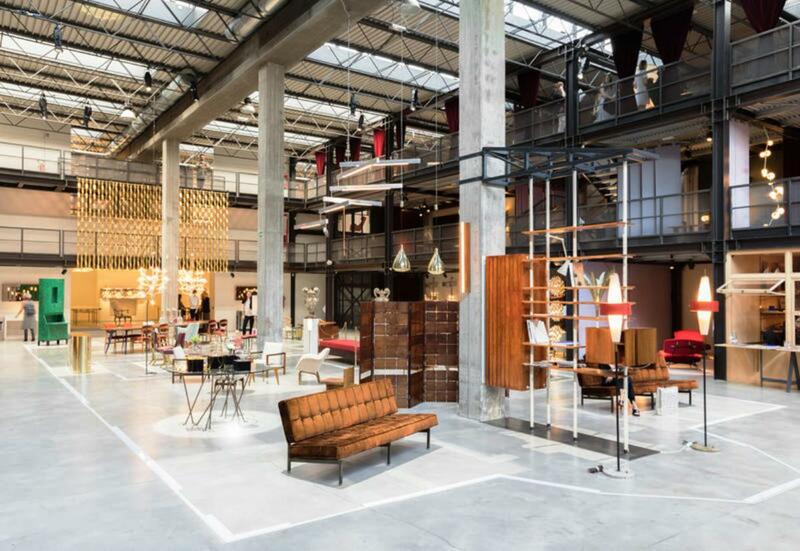 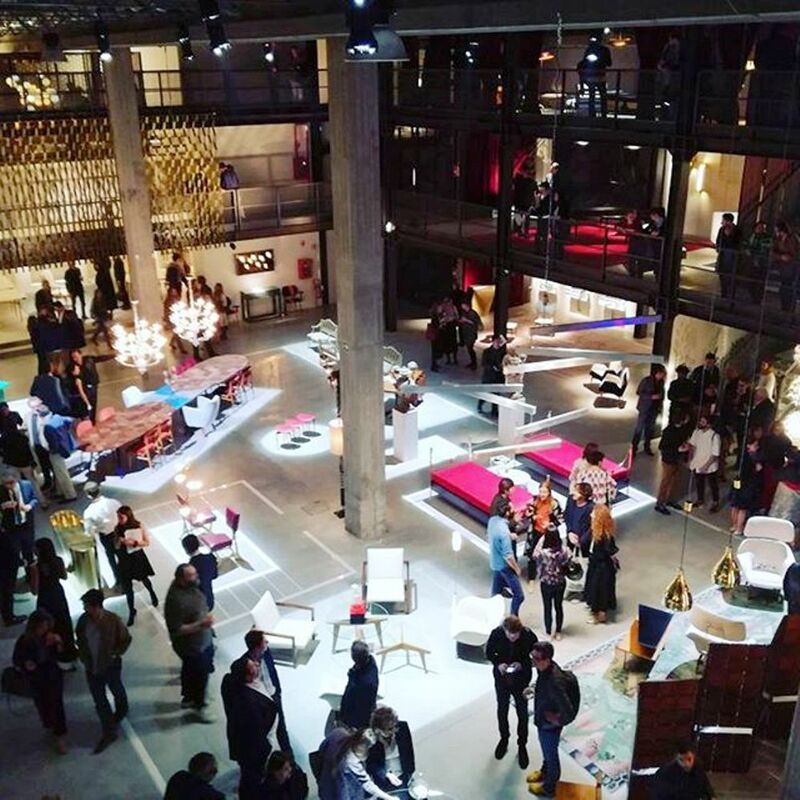 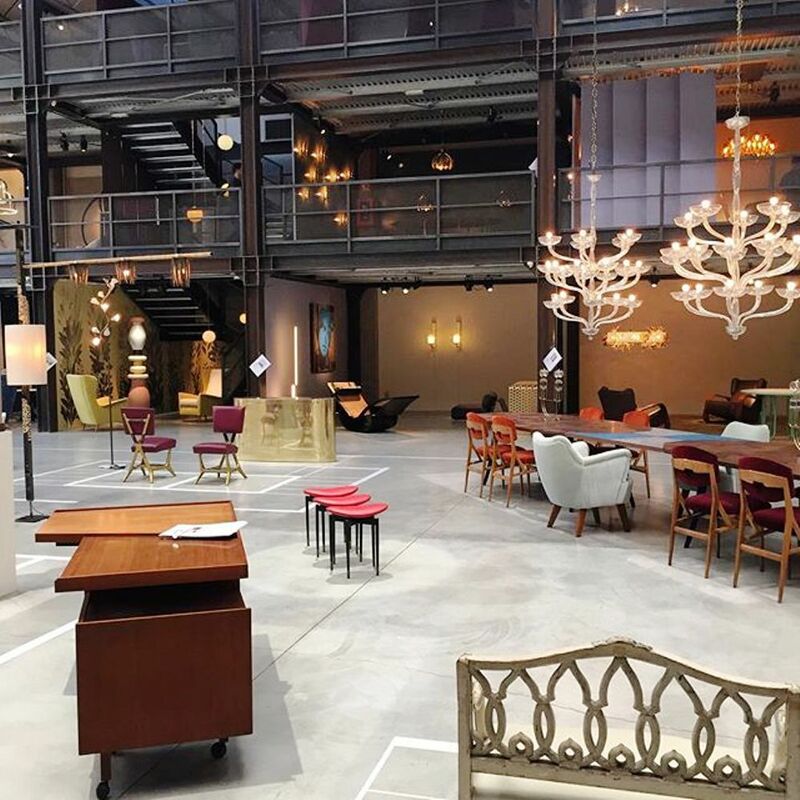 What was once an oversized ex-industrial space that kept Milan Design Gallerist Nina Yashar’s most treasured overflow of design loot has since 2015 become a full-on, full-sized three-story exhibition and display space spanning 1,500 square metres. 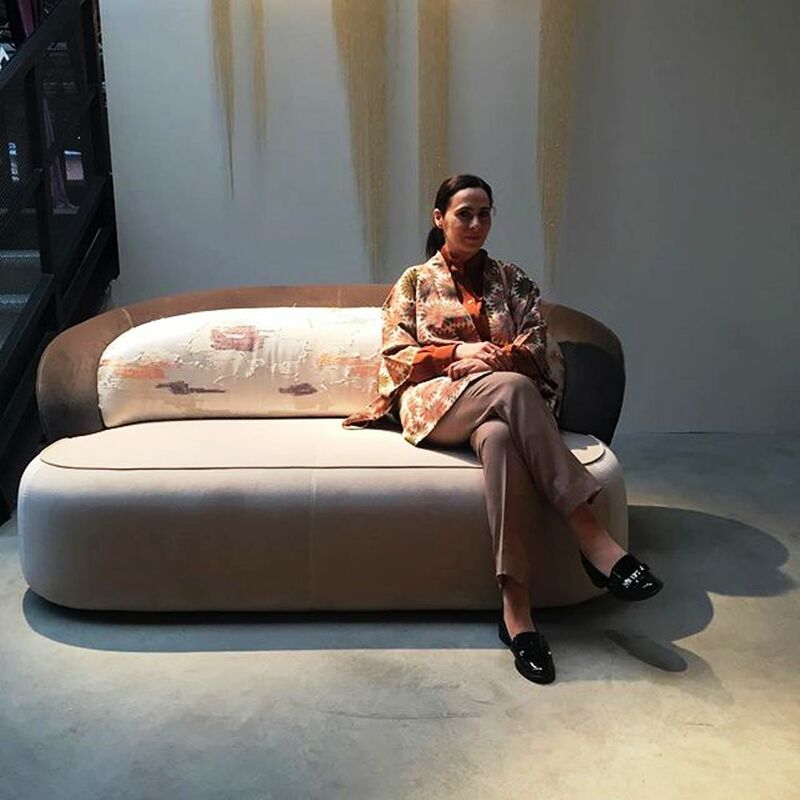 This year there are over 40 items, furniture and lights produced as editions by the gallery, including works by 12 new designers who have interpreted the personality of the Nilufar collection for the first time. 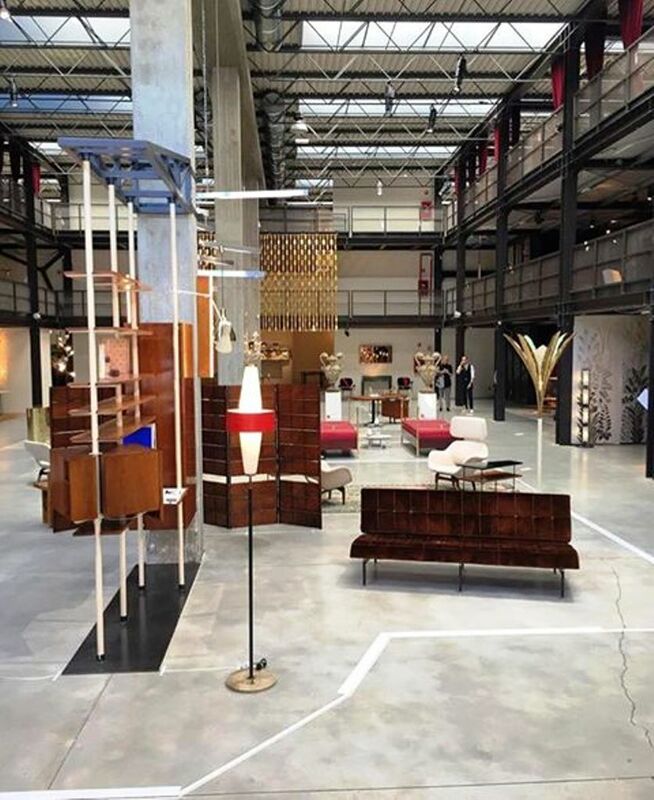 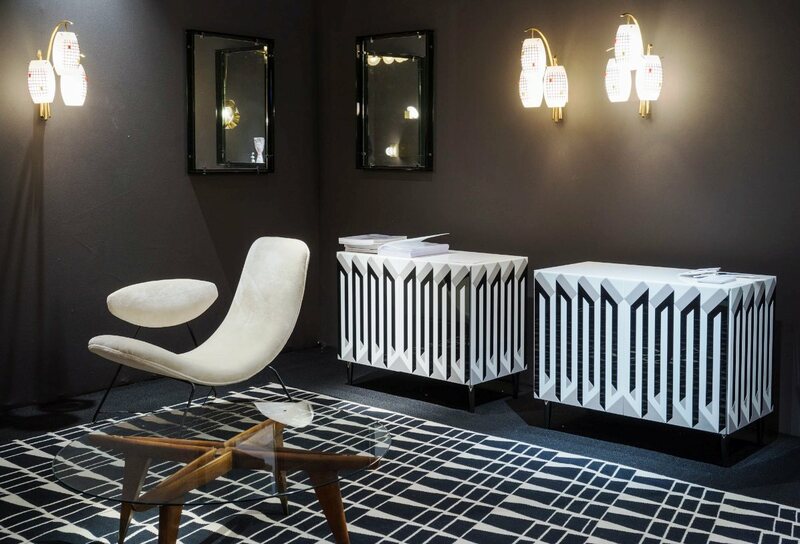 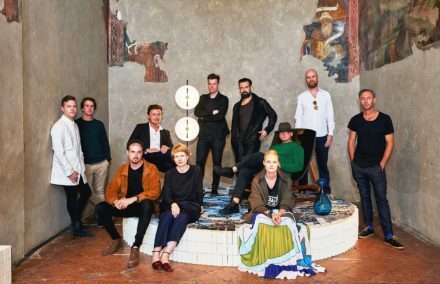 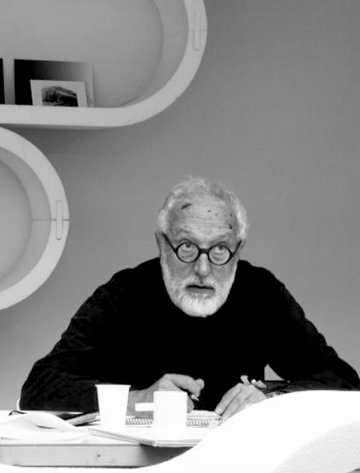 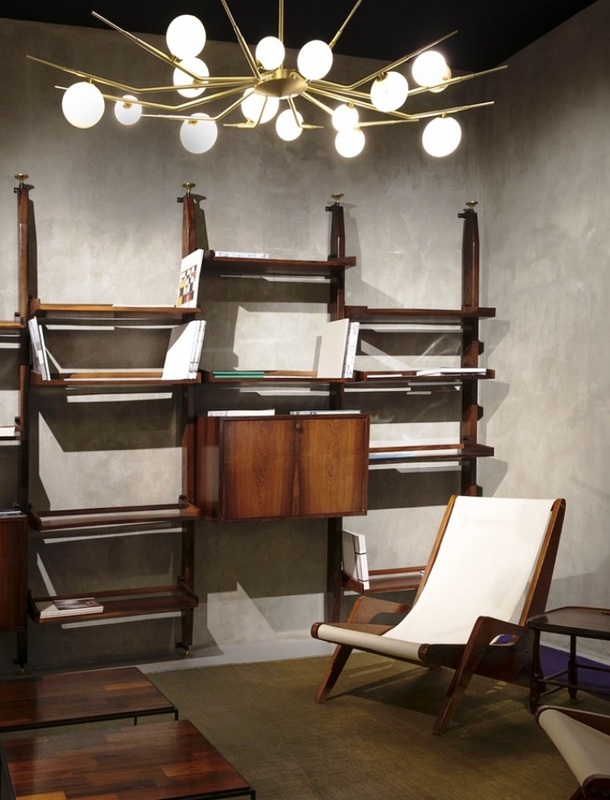 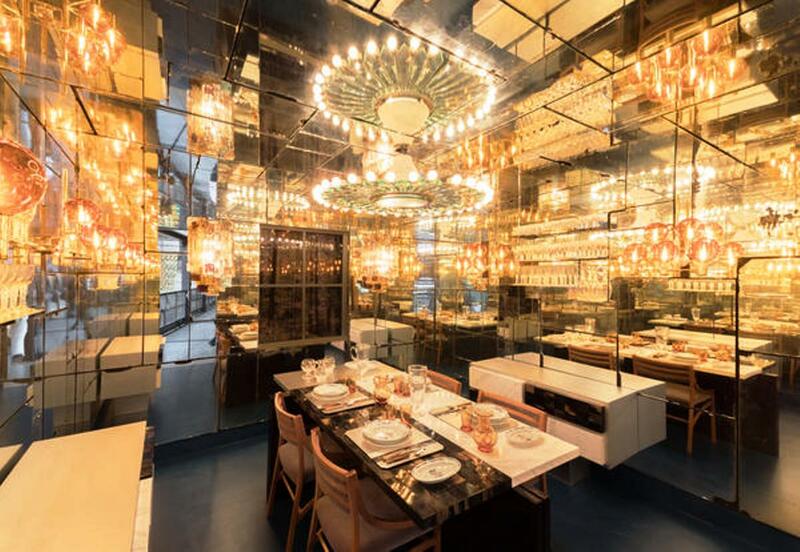 This is Nina Yashar’s vision of a Milan-based new Renaissance mixing original works by great designers, such as Giò Ponti, Carlo De Carli, Carlo Mollino, Ettore Sottsass, Osvaldo Borsani, Ico Parisi, Franco Albini, and new creations, produced in limited editions and unique pieces. 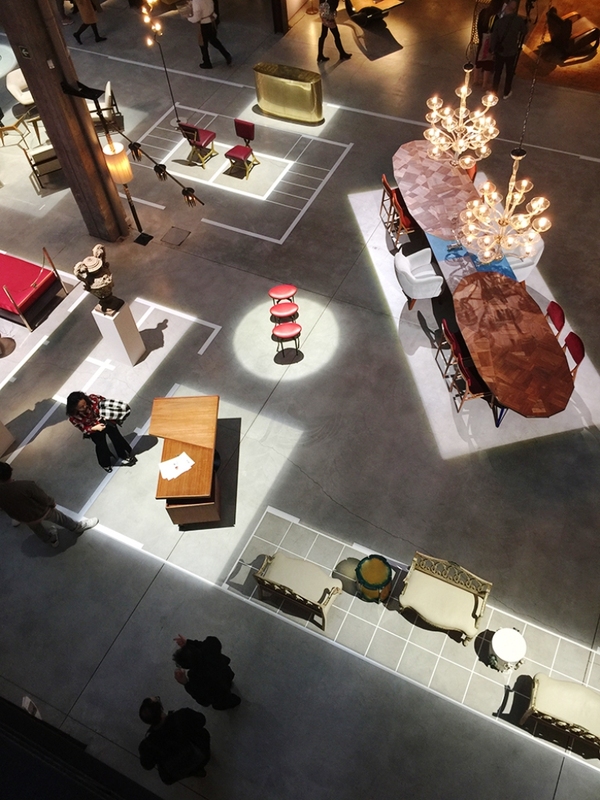 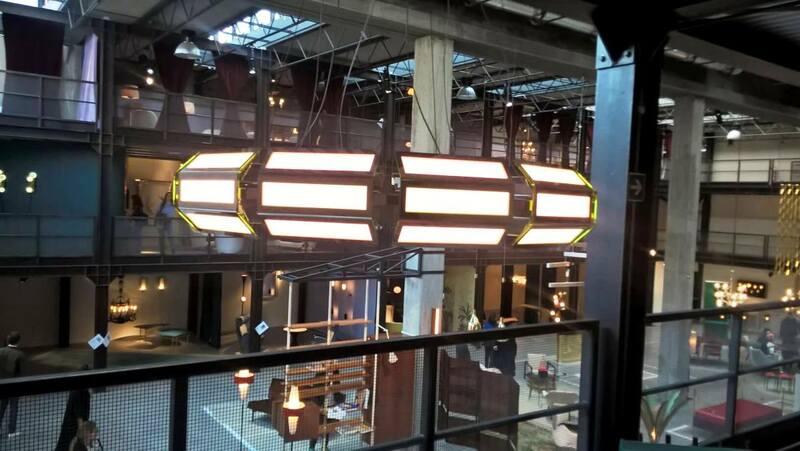 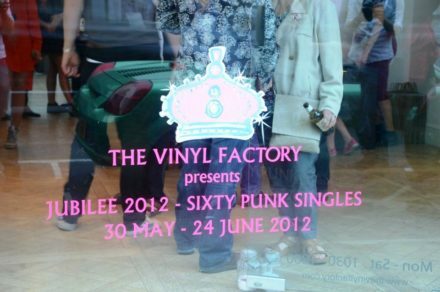 The lobby of the Depot is transformed into a stage, an imaginary room that displays the new projects of the artists and designers who collaborate with the gallery. 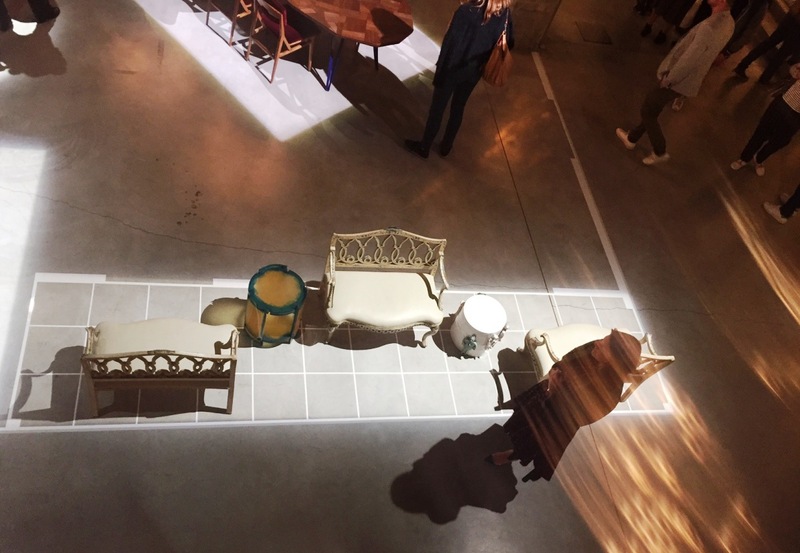 White tape on the floor suggest the ideal spaces of an imaginary layout on which to place a large one-off bookcase by Anna Castelli Ferrieri, ornamental vases in Florentine terracotta from the 17th century, a pair of beds by Carlo de Carli, and furnishings that take turns on the stage of the grand theatrical mechanism known as Nilufar Depot. 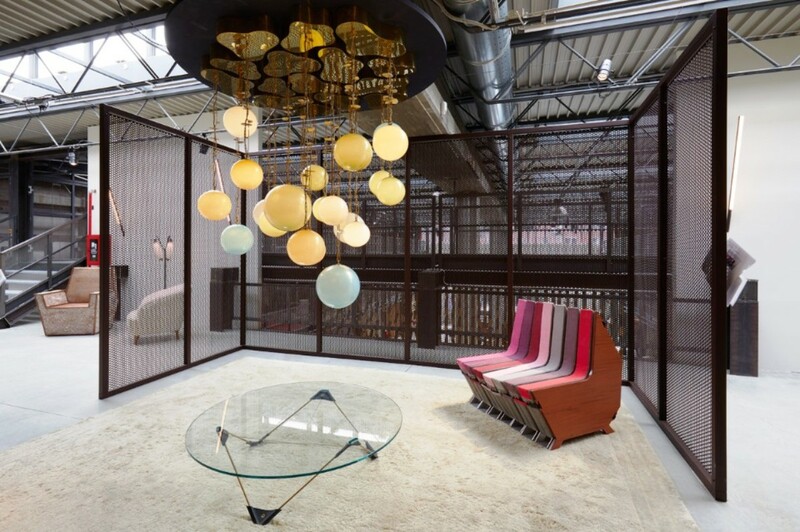 Parachute suspended chandelier by Michael Anastassiades, made of red lacquered brass and blown opal glass globes. 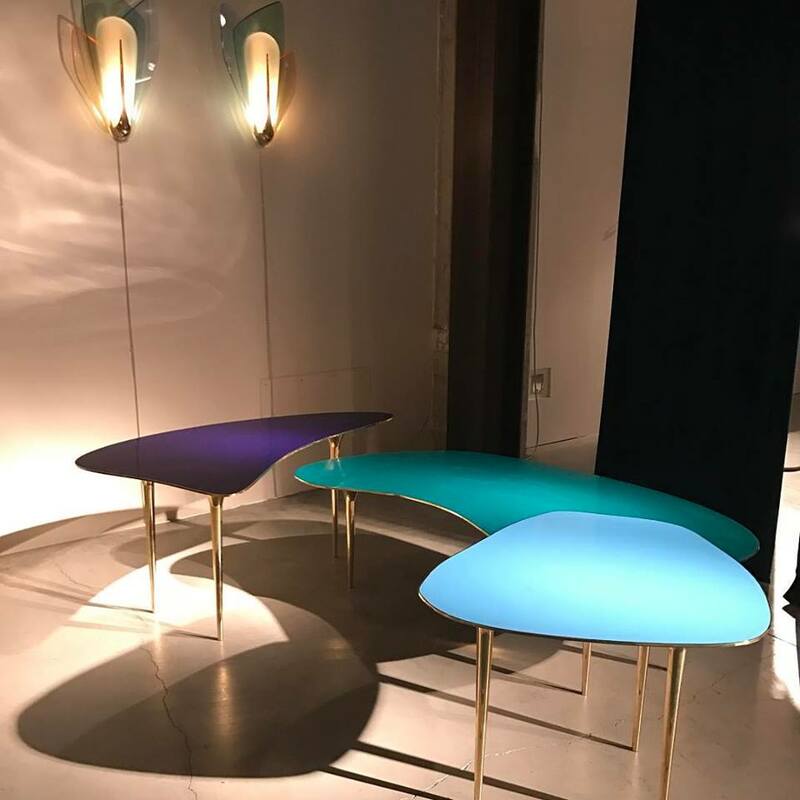 The Atollo tables by Massimiliano Locatelli, available in a limited edition of just 25 pieces. 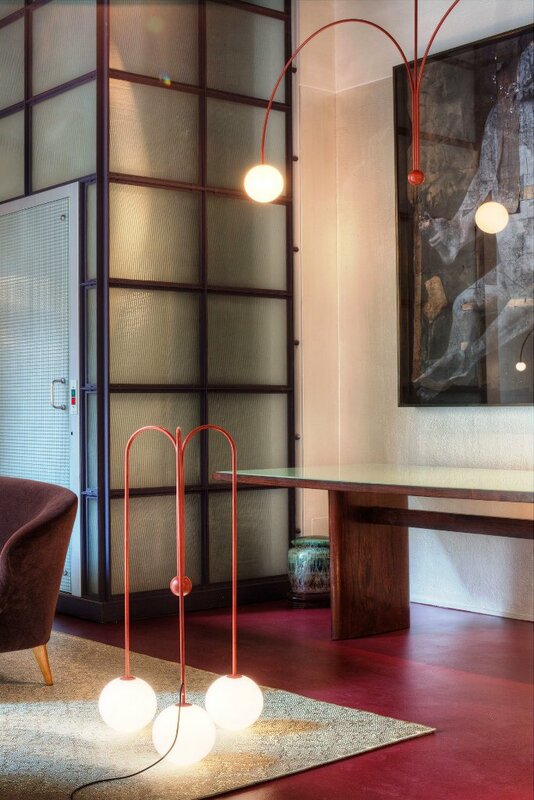 Tops in brass edge, coral, different colors enamels with polished finish, manufactured using the jewelry technique known as “cold enamel”. 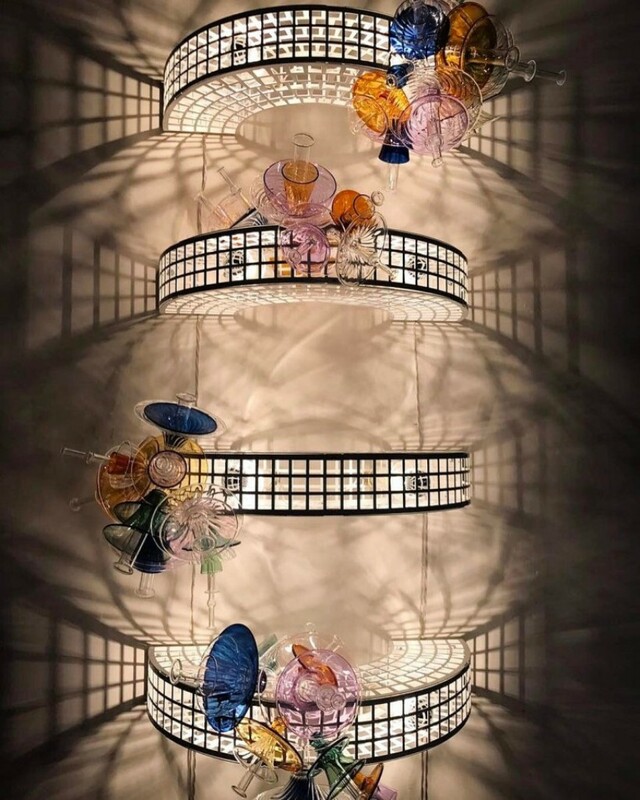 The Nilufar exhibition also includes the suspended and trellis wall Mobile chandelier by Bethan Laura Wood, made of a circular steel and brass frame with hand blown Pyrex glass decorations. 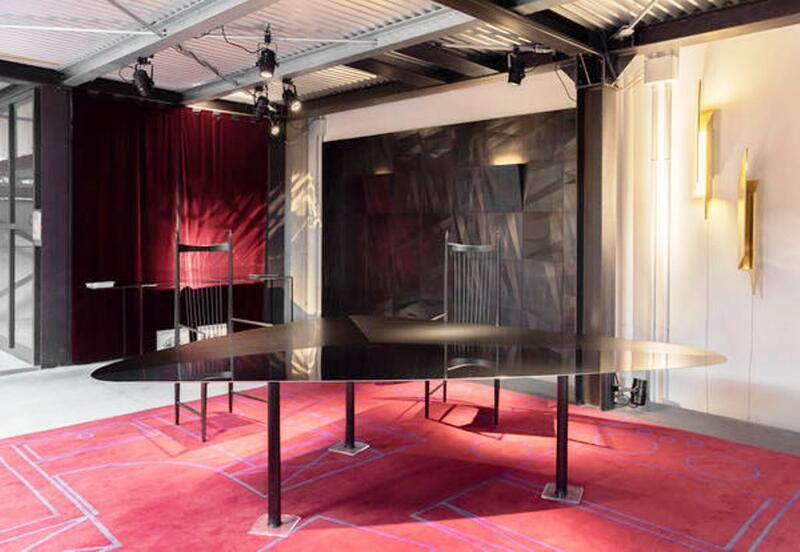 The black 3 legged Butterfly table by Claude Missir is composed of three triangular sheets, available in different customizable stainless steel shades. 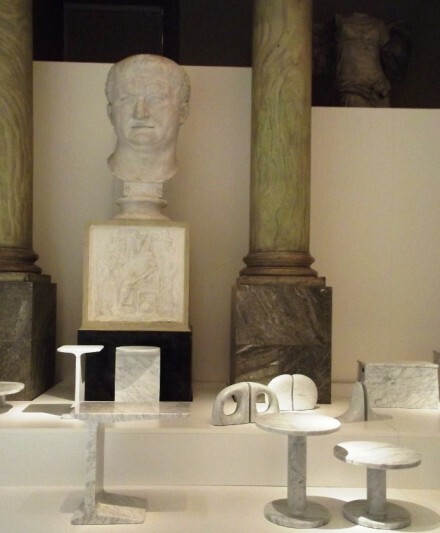 Stunning table and cabinet from the Horn collection by Baciocchi Associati, made of aluminum, marble and horn. 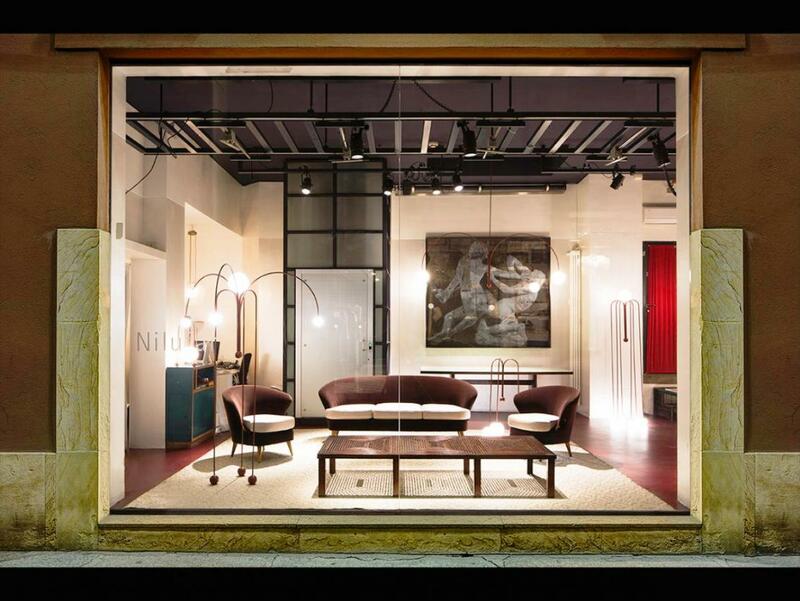 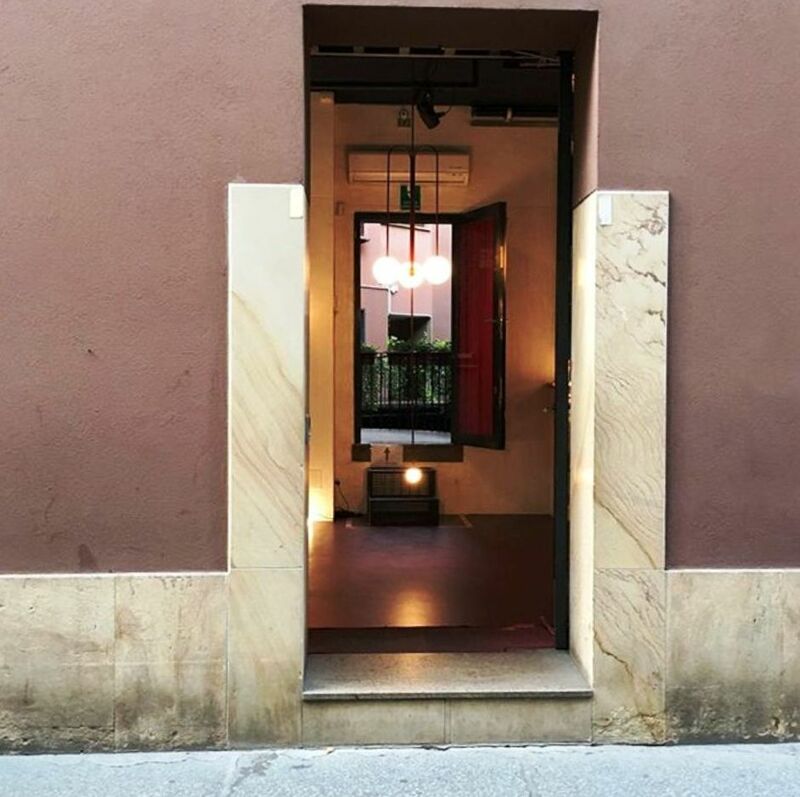 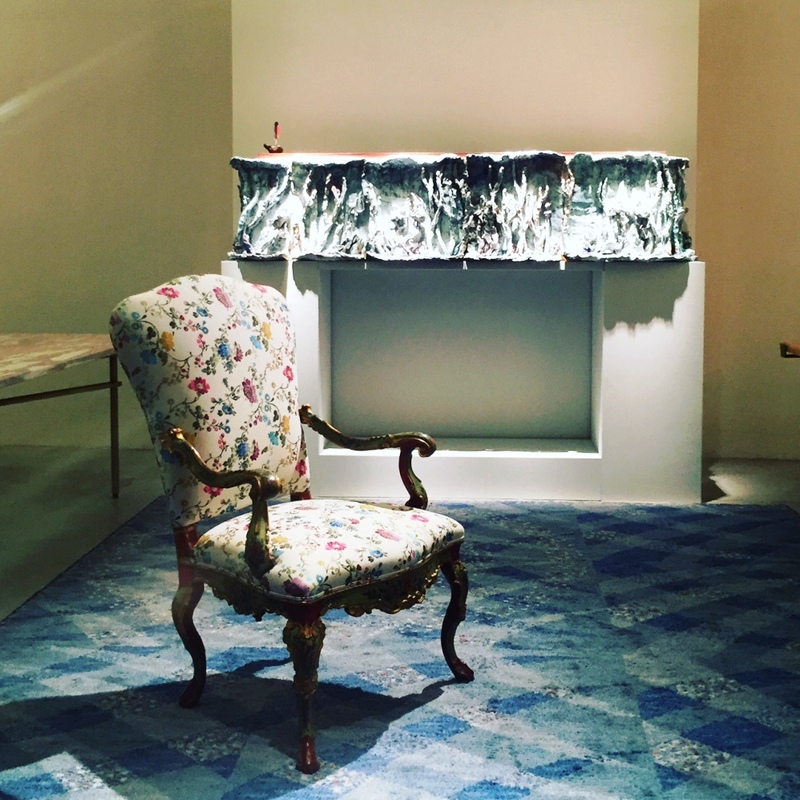 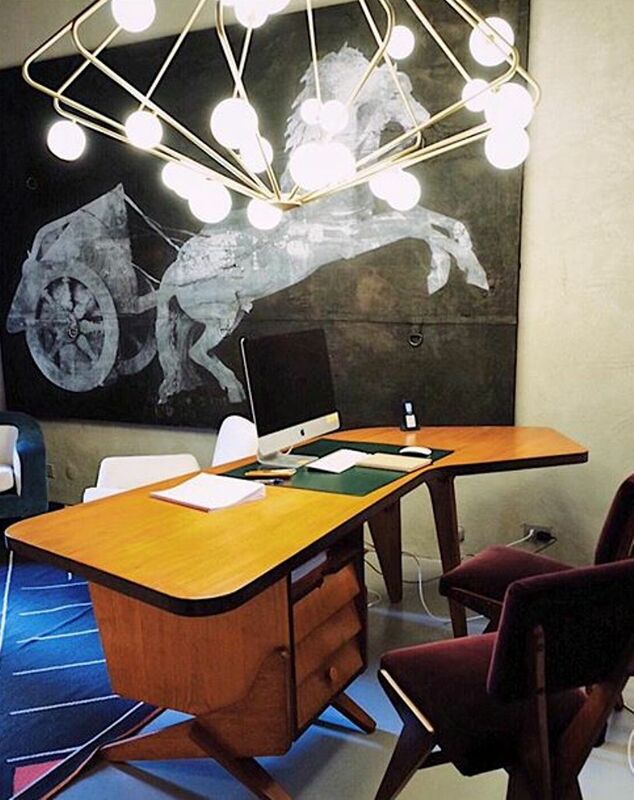 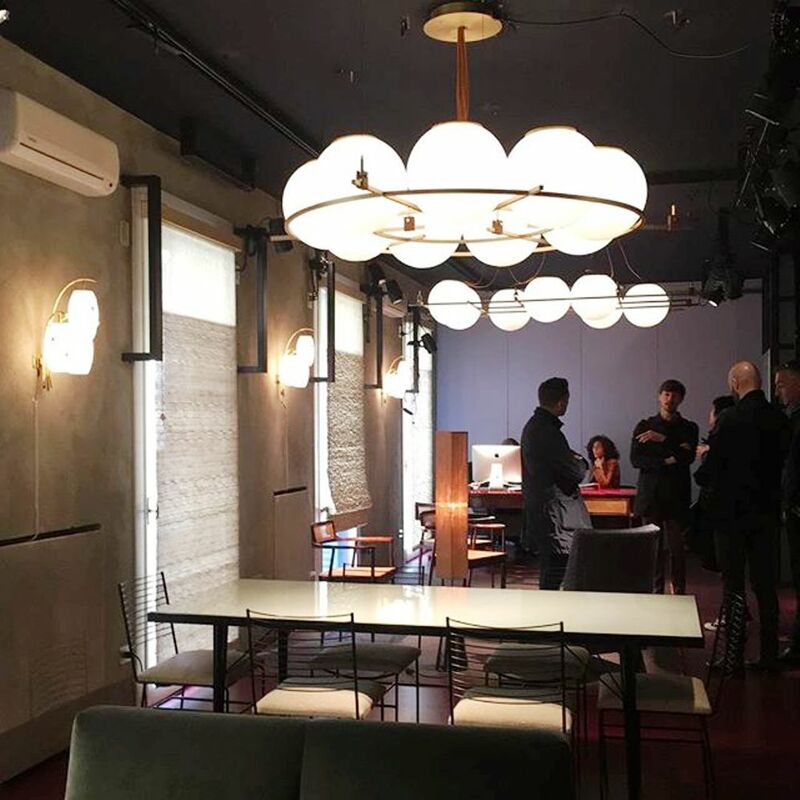 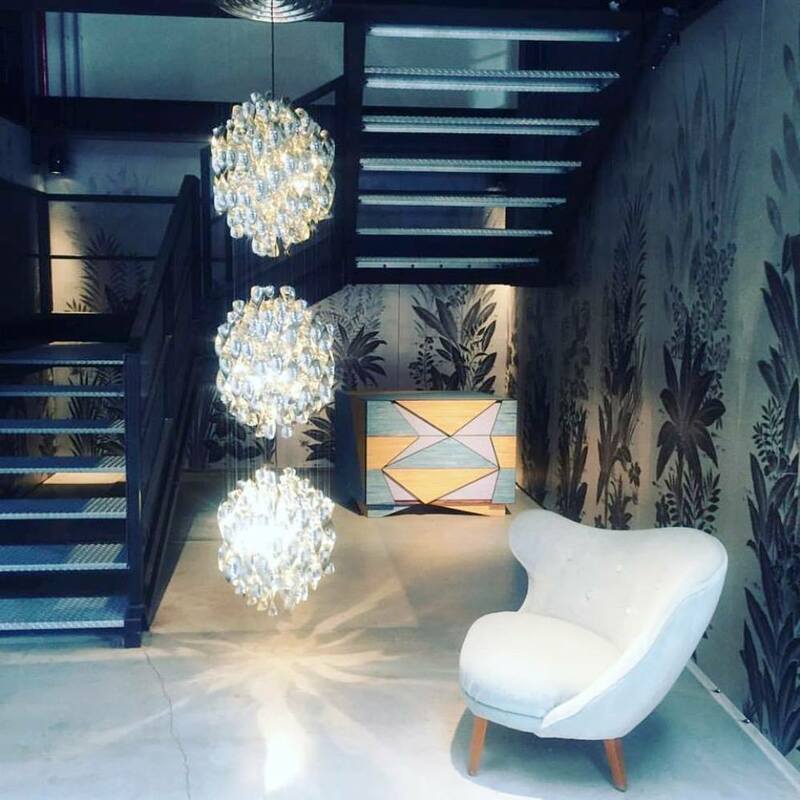 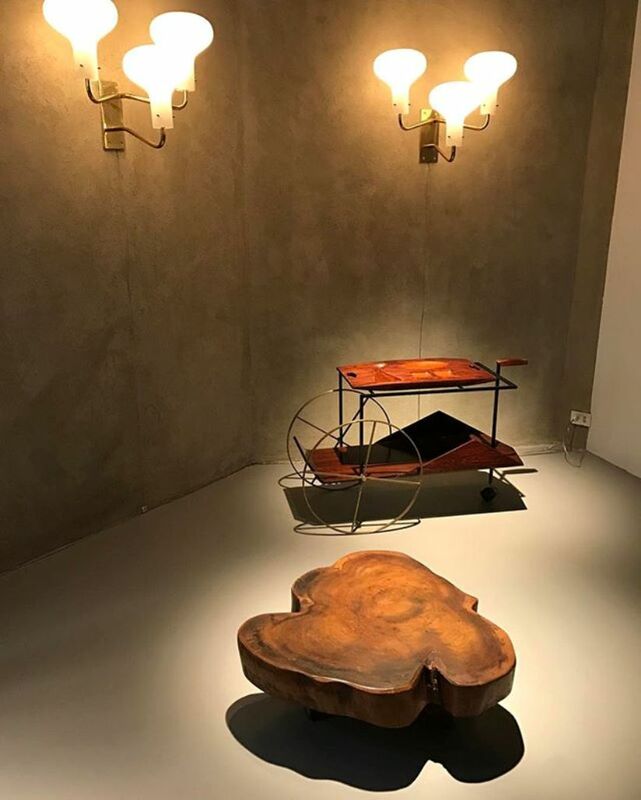 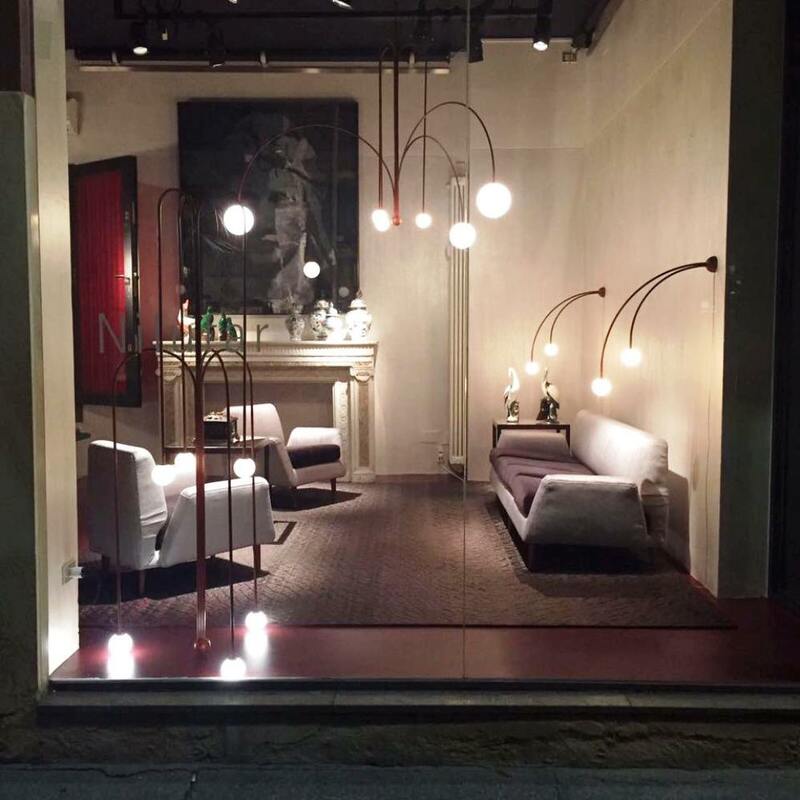 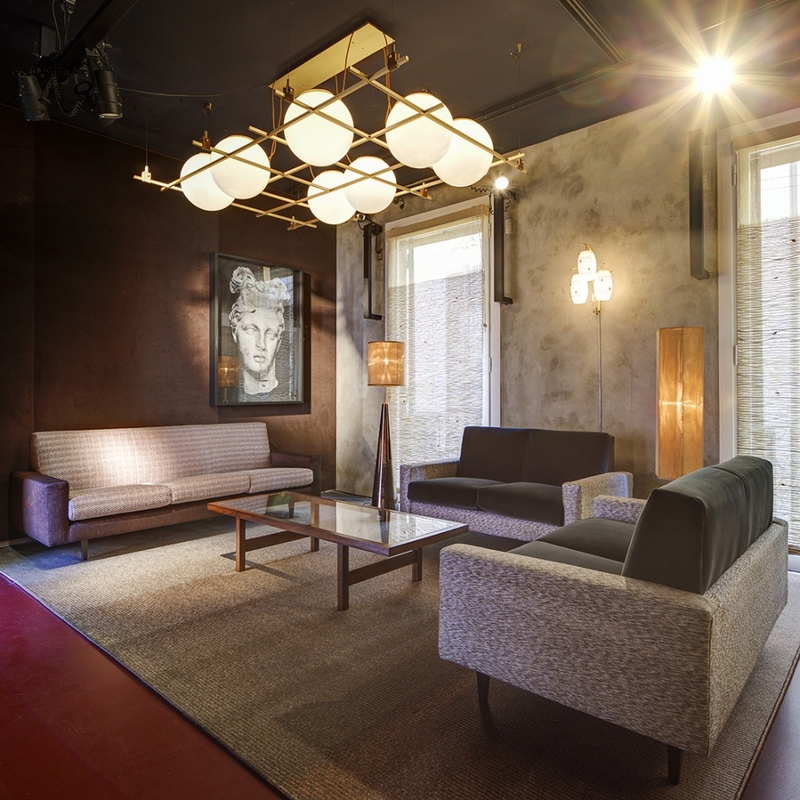 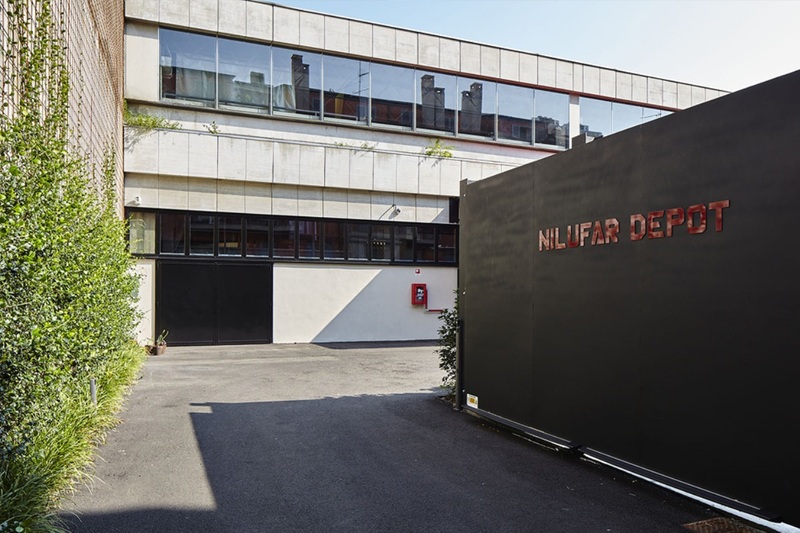 Nilufar Gallery used its space on the Via della Spiga to create a conversation between a historic and a contemporary designer. 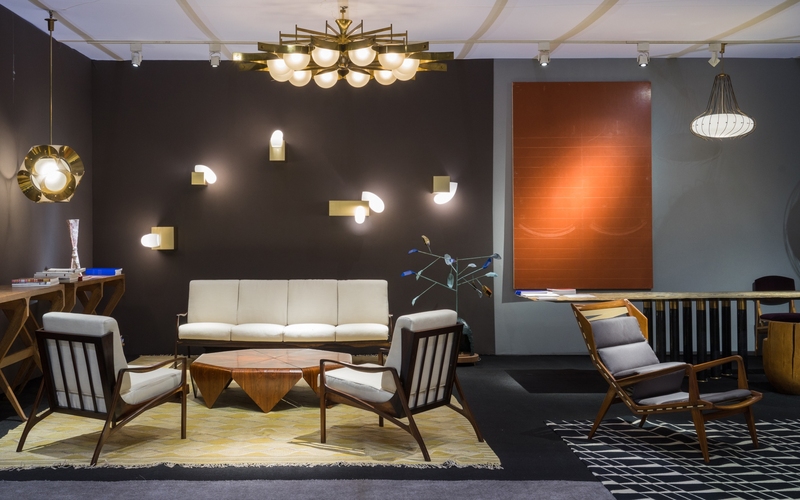 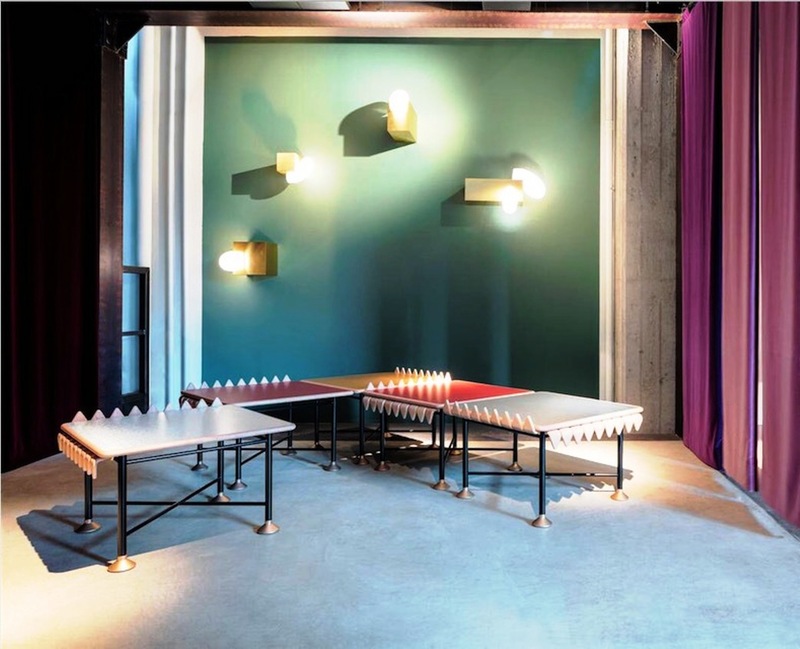 Furnishings by pioneering Brazilian modernist Joaquim Tenreiro are illuminated with lighting from Anastassiades’ Fontana Amarosa collection to create a space that bridges styles and eras. 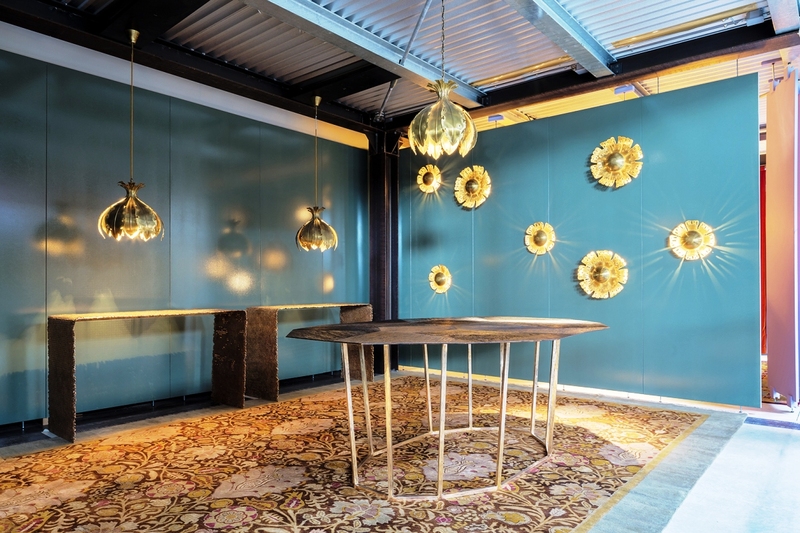 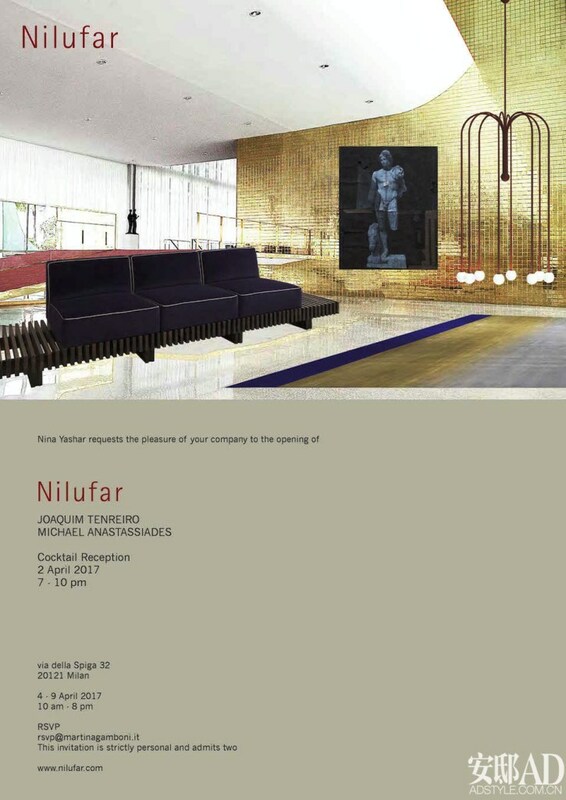 The collection of Amorosa Fountain lamps that Michael Anastassiades has made exclusively for Nilufar were inspired by the myth of Aphrodite. 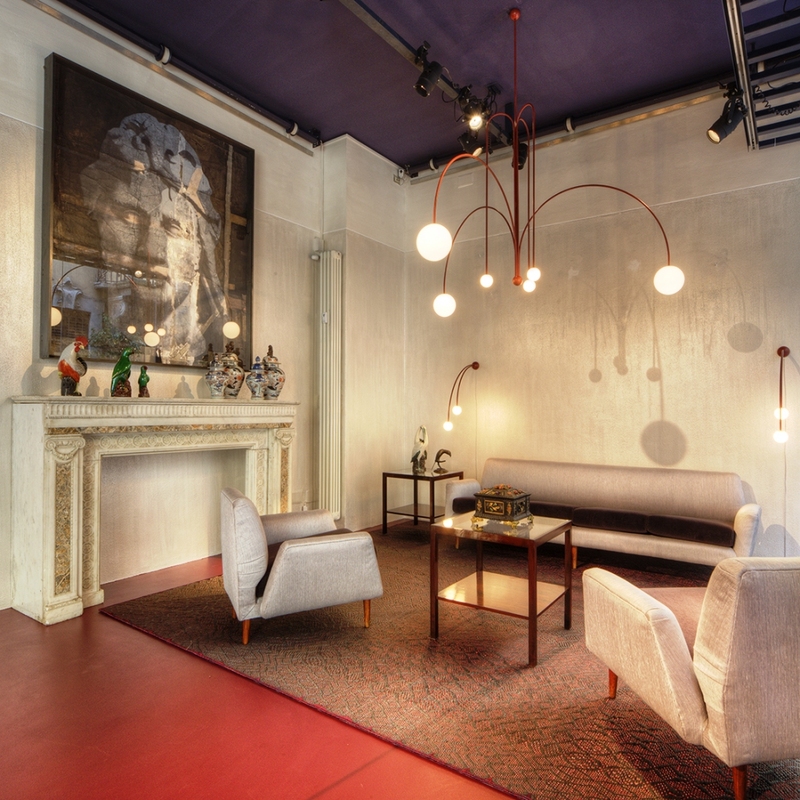 These are exquisite red coated brass curved structures that meet hand-blown opal-lighted balls. 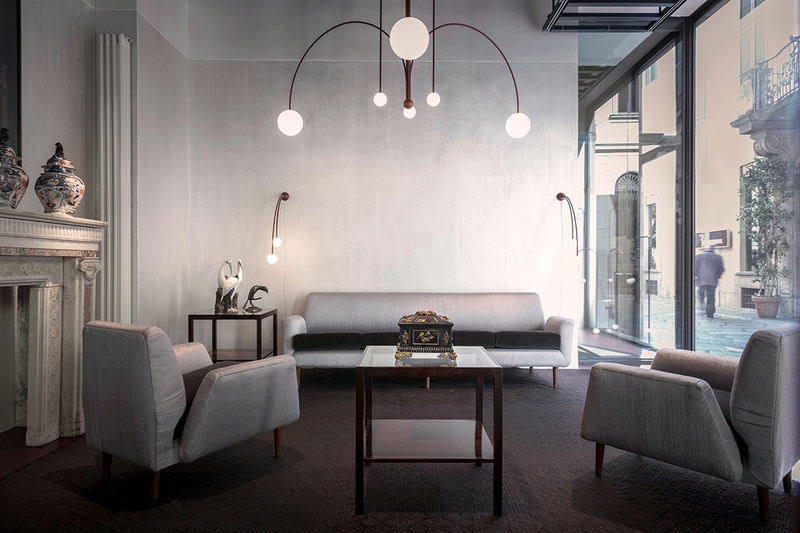 Fontana Amorosa collection of lamps by Michael Anastassiades for Nilufar Gallery. 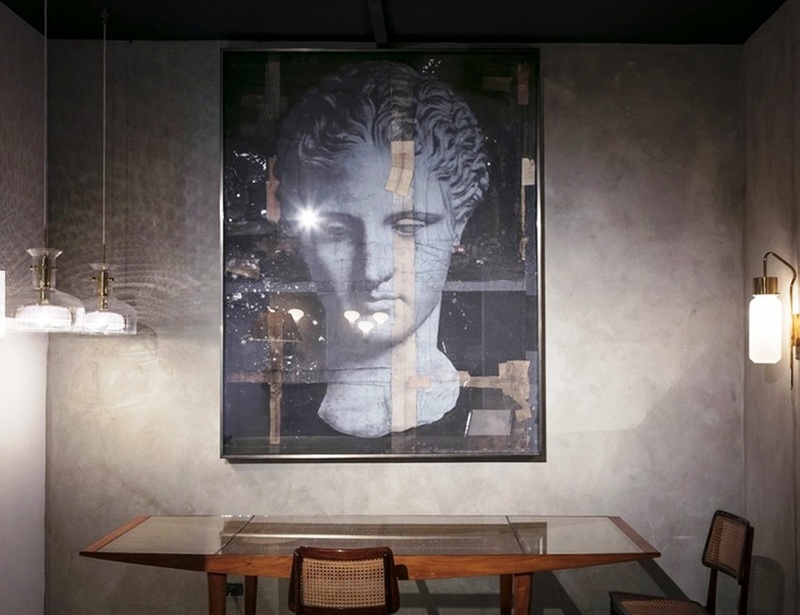 Completing the exhibition was a selection of works by artist Luca Pignatelli, images that recall classical Rome on various media that induce visitors to confront with places and cultures far away. 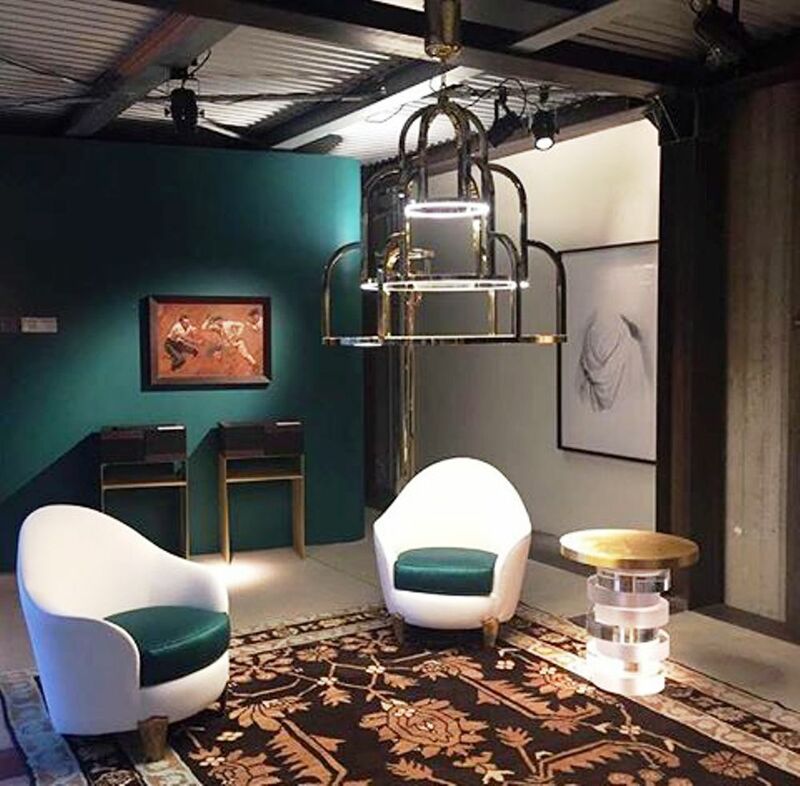 To the Triangle collection by Cathrine Raben Davidsen / CRD Study, floor lamps with enamelled ceramic base, bronze structure and bronze metal lamp shade, cylindrical or hexagonal. 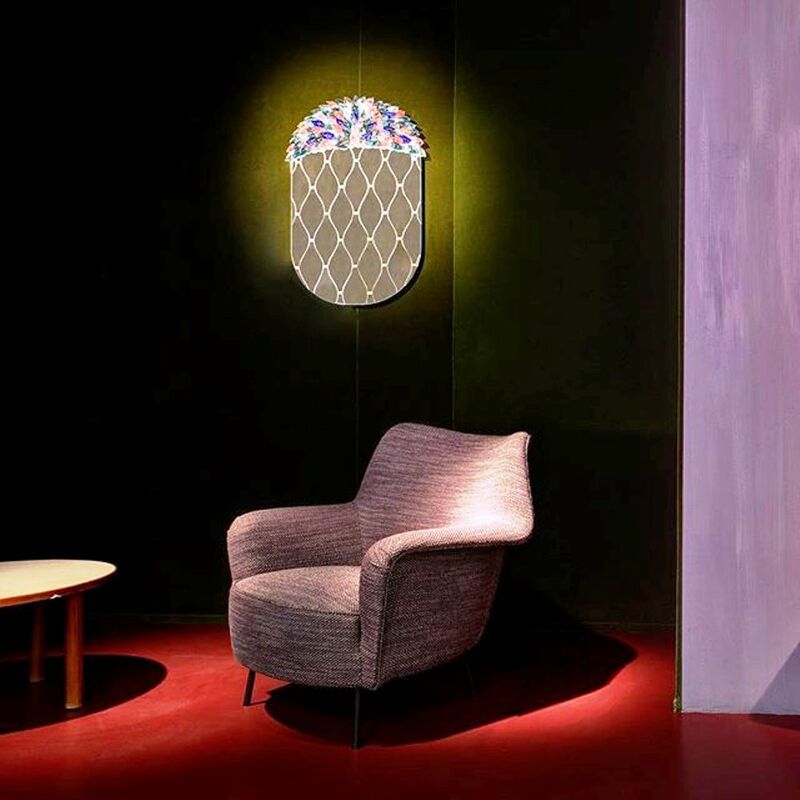 Among the contemporary projects, the Redor mirrored the Duo Zanellato / Bortotto mirror, a finely decorated object with a lusanga pattern and embellished with a crown of colorful leaves reinterpreting the Murano tradition in a contemporary key. 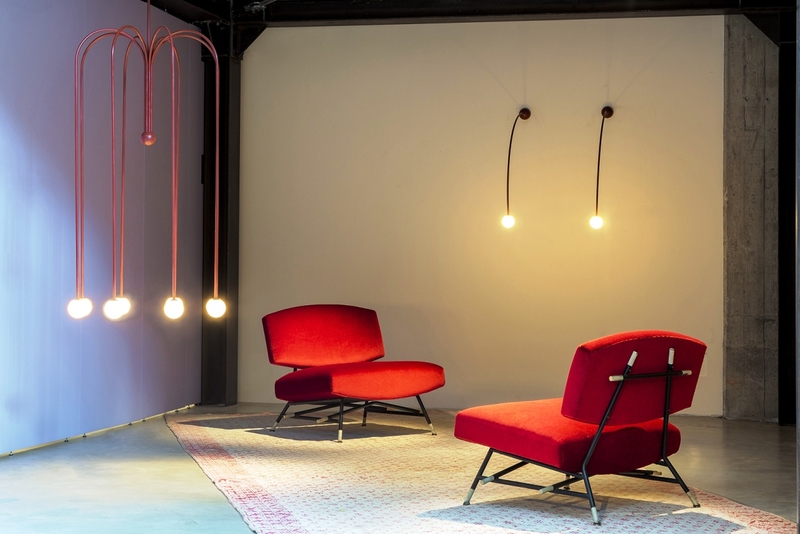 The GRID version of SHAPES series of lighting fixtures by Federico Peri for Nilufar Gallery. 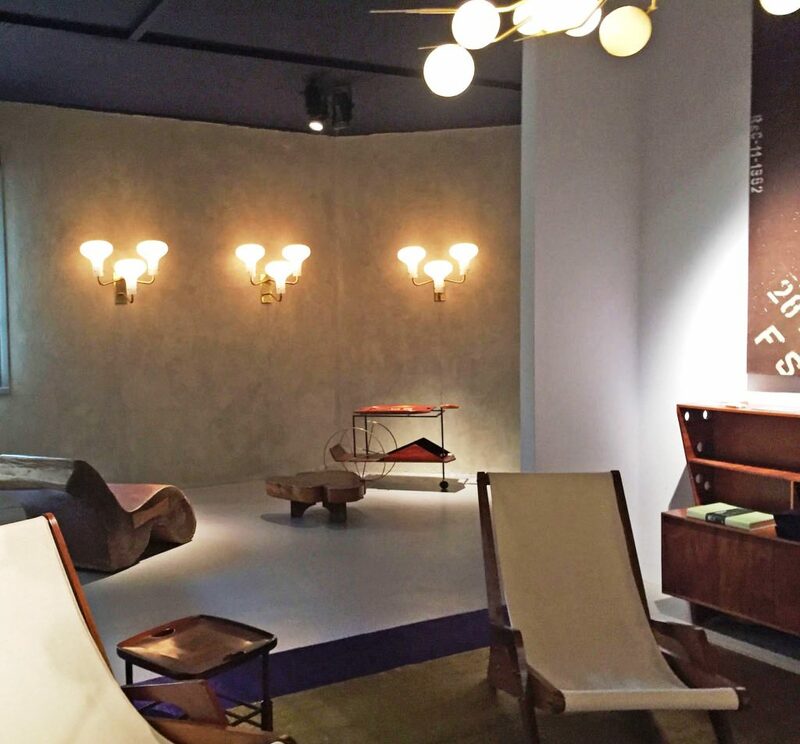 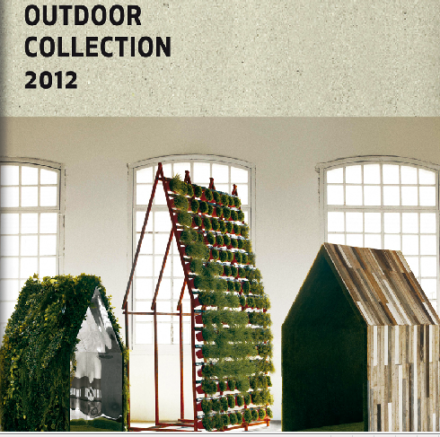 Nina Yashar presented a selection of over 40 pieces enriched by precious Dedar and Hechizoo covers by Jorge Lizarazo.